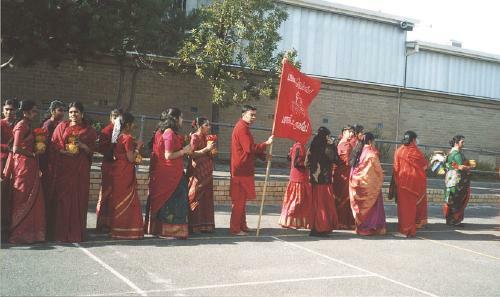 With Ammas blessing this Mandram was started on 7th November 1999 near the city of Melbourne. Weekly worships in two places: Clarinda &Dandenong. Clarinda - Every Tuesday 7.15 - 9.00 p.m.
Dandenong - Every Sunday 6.30 - 8.30 p.m. The devotees of the three centers in Melbourne with Amma's wholehearted blessings, jointly organized this year's adhi pooram festival. It was planned to give an opportunity to each an every devotee to be part of the festival and get Annai's blessings to diminish his or her karmas. Kanchi was prepared from a collection of a handful of rice from each devotee. 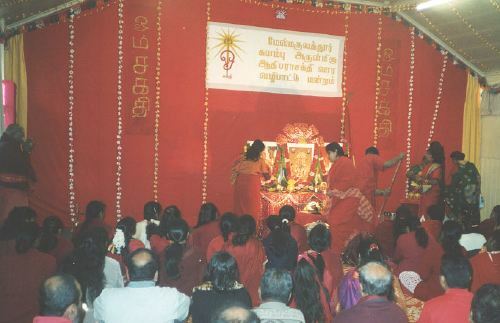 Devotees carrying kanchi Kalayam on their heads and praying Annai by chanting "Aum sakthi, para sakthi" went on a parade to pour the kanchi to Annai. Annai's flag bearers followed by the holy picture of Her feet, 9 kalasams and 9 Aum sakthi lanterns accompanied by nathaswara melavathiyam and thalamai kanchi, led the kanchi parade. Devotees also had the opportunity to perform a 'palabishekam' for the Suyambu with their own hands. This year Adihalar's holy picture, Aathiparasakthi's karuvarai holy picture and deity of Suyambu, Guru and Annai made together, were arranged on the special alangara peetam and were carried on shoulders by the devotees. 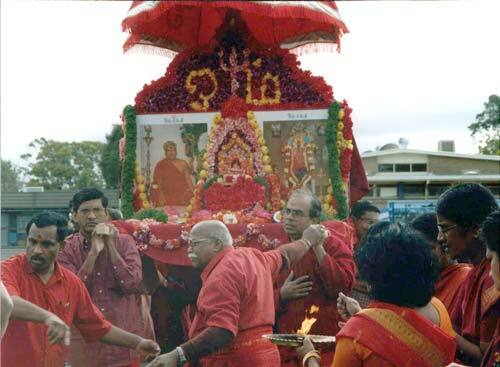 Annai paraded with melavathiyam followed by devotees carrying kanchi kalayams. In addition Annai's Adipura kanchi from Melmaruvathur sithar peetam was mixed to the kanchi according to Annai's wishes, enabling the devotees who took part in the festival to receive the blessings of Annai. Inbathamil radio that operates 24 hours from Sydney gave a live broadcast of this grand event for the benefit of interstate devotees. The continuous support from the devotees and some dreams relating to this event has imparted more spirituality. Final part was the Annathanam. In the weeks that followed devotees had called to tell about the incidents and spiritual experiences they had gained during the festival. Adhi Pooram festival was grand, Annai's wish and blessings made it all possible. This year's Adhi Pooram festival in Melbourne was more graceful than ever before. This was only made possible by Amma's blessings. We requested a sakthi from Chennai to perform paada poojai to get Amma's blessings and to find out when to celebrate Adhi Pooram in Melbourne. 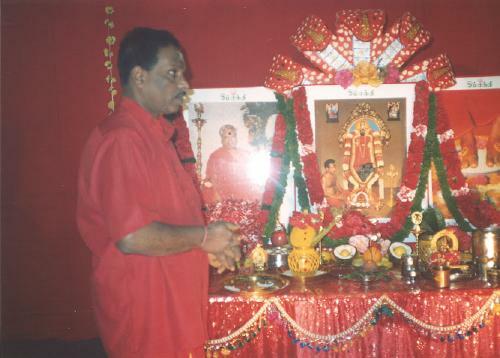 At the paada poojai Amma had given the blessing and said "Celebrate Adhi Pooram on Sunday (03-08-2003) in grand way! Tell them not to have poojai on rented places any more. Ask them to look for a place they could own!" Decorations and preparations for 'Kanchi' parade began on Saturday morning. Many sakthis actively participated in the arrangements. Despite the cold weather many sakthis helped in preparing the Kanchi at night. Others were actively involved in decorations and other arrangements till late night. All this made one to wonder if Amma's visit to Australia is nearing ever closer. The Kanchi parade began with joint prayers at 10 AM. Kanchi flag reading 'Bangaru thievame Parasakthi uruvamei!' was carried in front of the parade. There were 9 Kalasams, 9 flower trays am 9 Kamachi lamps The parade was led by a sakthi who got absorbed by Amma's recent miracles it Australia. With lime, coconut and pumpkin 'thristi kalithal' was done at four corners during the parade. Inclusion of 'mangala vathiyam' nathaswaram was one of Amma's miracles. The performers volunteered to join the parade and made this a grand parade. The 3 holy pictures, which were given to the Melbourne center by sithar peetam, were decorated with flowers and neem leaves. Standing in front of the Karuvarai picture gave the feeling of standing in front of the Karuvarai in Melmaruvathur. The 3 pictures have become part of our center. The holiness of those pictures could be felt while attending the regular prayers on Tuesdays. Since the number of participants had gone up this year the Kanchi Kalaya parade route was slightly increased. Sakthis one by one went around the Karuvarai pictures and poured the Kanchi fron their Kanchi Kalayams kneeling down Poojai and prayers followed. Proceedings were broadcast live by a private radio station. This was beneficial to people from other states in Australia. For the first time sakthis did 'Palabishekam' with their own hands to the deity of Annai, Aadihala and Suyambu made together. The 4th edition of the spiritual newsletter, "Aum Sakthi" was published by the center to convey spiritual thoughts to people and to tell about its activities. Prayers were followed by annathanam. Adhi Parasakthi festival was celebrated in a grand scale. Amma's wish. For pictures and information about last year's Adipooram go here.